I was fortunate enough to get my hands on an early bundle of Pie Making Day. 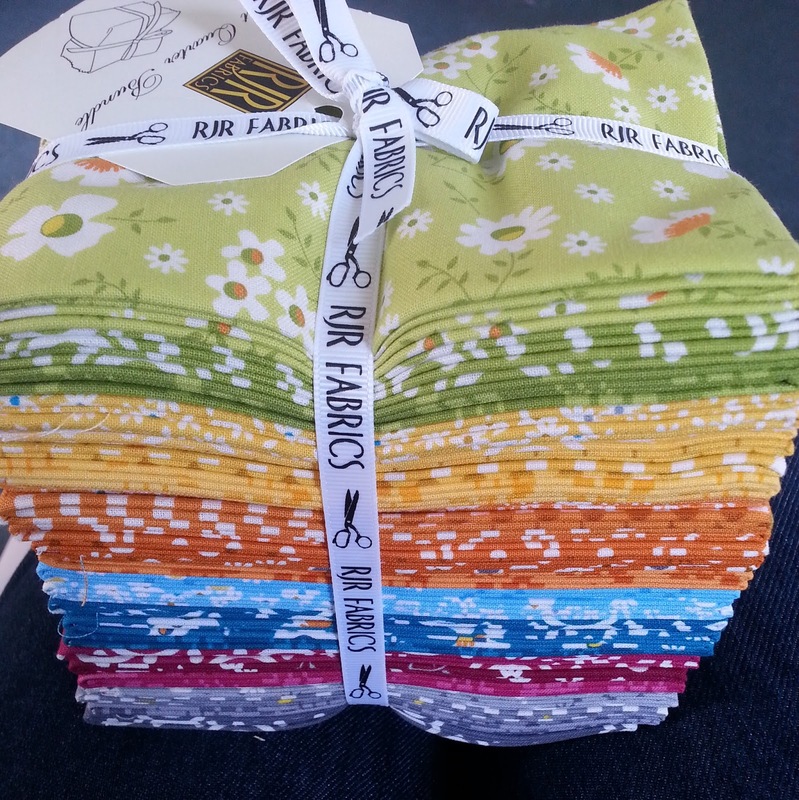 This is an amazing range of blender fabrics designed by Brenda Ratliff for RJR fabrics. All the fabrics in the line are retro inspired prints and are not only really useful but also great fun to work with. The moment I saw the fabrics, I knew that I wanted to make something fun and colourful. I put my thinking cap on and waited for inspiration to strike. For a while, I had been wanting to make a follow-up block to the Singing In The Rain pattern. I liked the idea of designing some more human figures, but the pose had to be right. I tried a few things but wasn't happy with any of them. Then I thought of Toulouse Lautrec and his wonderful posters with Can Can Dancers. 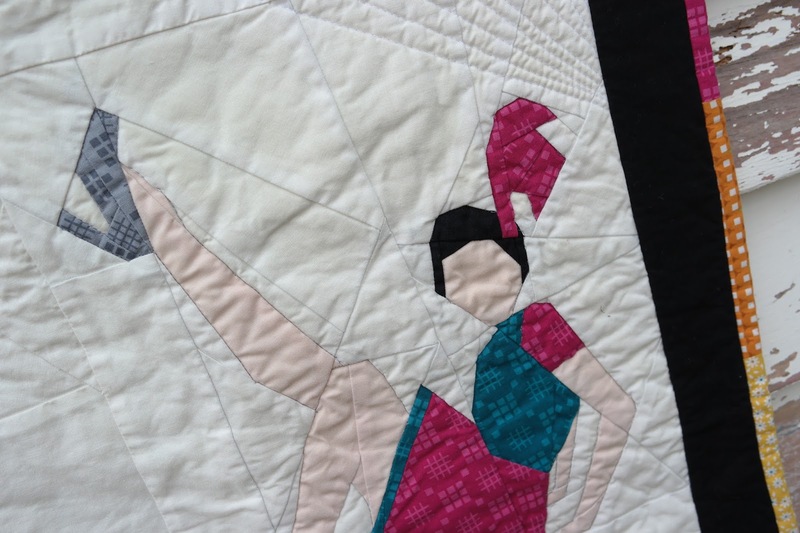 The idea of doing a Chorus Line quilt popped into my head and I just couldn't get past it! Don't you just love those high heels? My original plan was to make a table runner, but I felt as if I'd made a lot of them recently and even though I liked the design, I wanted to do something else instead. 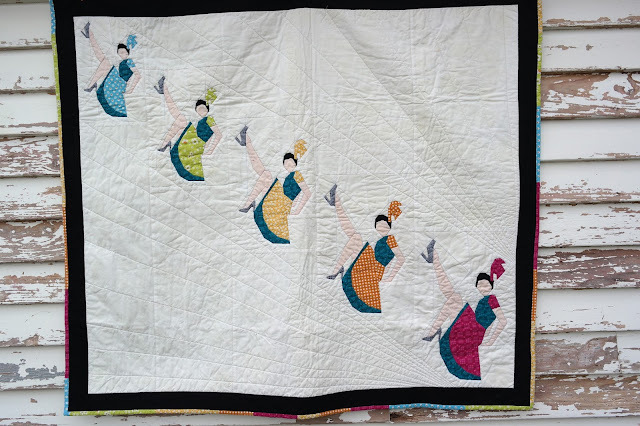 Then I thought of a quilt with a row of dancers along the bottom. The idea was better, but somehow not quite right. 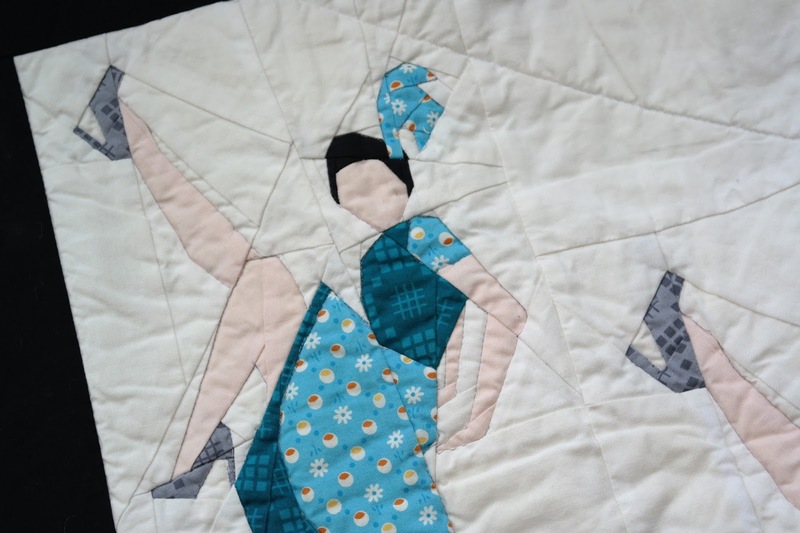 I was unsure how to quilt all the negative space and didn't want to send this quilt away to be quilted- I wanted to do it myself. Things began to get more exciting when I considered a diagonal of dancers and as a final touch I added a feeling of perspective by making the dancers in the foreground bigger and those in the background smaller. I have been finding instagram a really good way to hold discussions lately and to find out what you guys want in your patterns. I went on there and asked people what they wanted. A single block pattern, a number of versions of the quilt block together with quilt layout suggestions, or a complete quilt pattern. 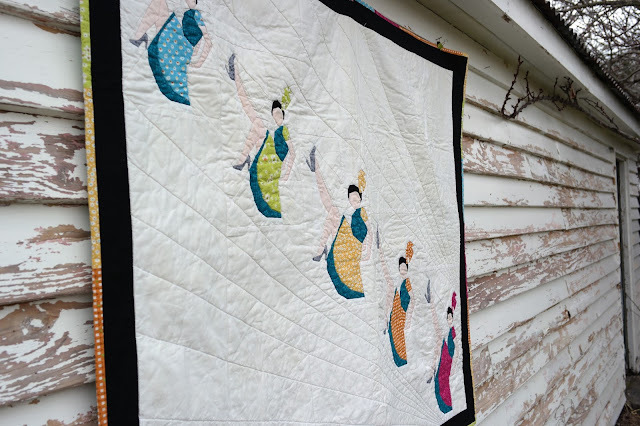 I will admit that I was rather relieved that people did not want a complete quilt pattern, but there seemed to be a definite interest in more than a single basic pattern block. I decided to give people as many options as possible. I have provided five different sizes of the block, so that you can easily make a Chorus Line quilt like mine if you want. 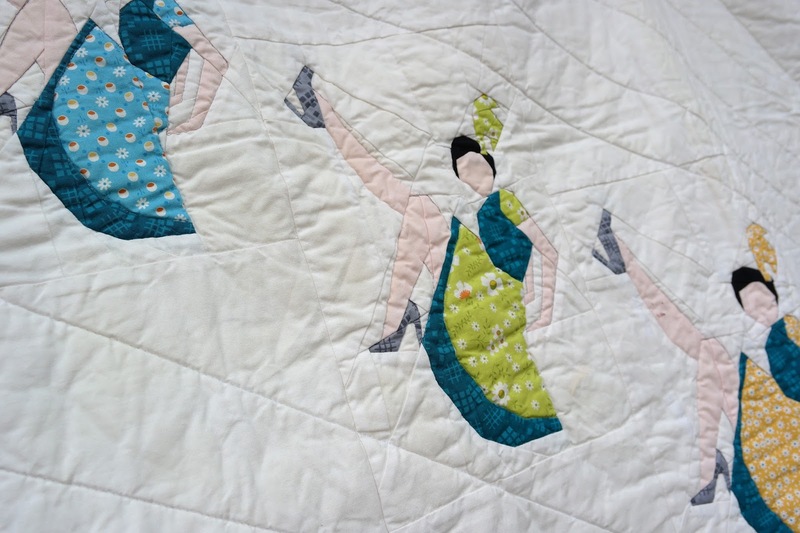 I also included copies of the pattern where the dancer is kicking in the other direction. In total there are pattern pieces for 10 variations on the basic block in this pattern. 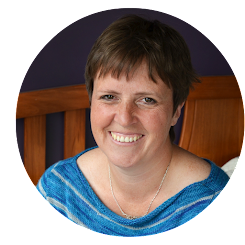 Hopefully this will give you loads of options when you get round to creating your own projects. 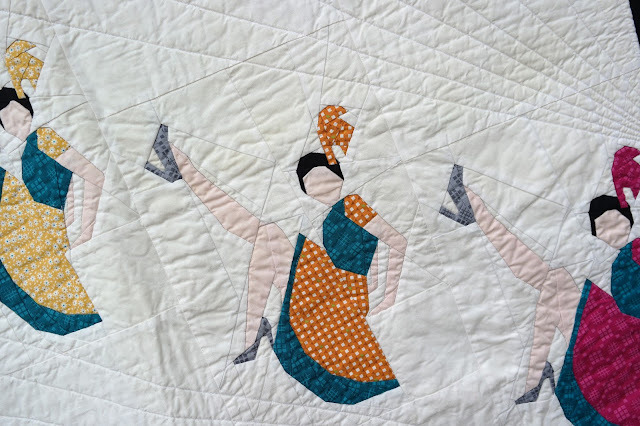 When it came to quilting of my quilt, the only thing that I knew for certain was that I wanted to stitch the ditch around the dancers. I did this using a mid grey thread in an effort to give the legs a bit of definition from the white background fabric. As for the background quilting, I was uncertain for a long time. I eventually decided to keep things simple and to do a fan of straight lines as if they were lines of perspective. As a friend pointed out, this gives the quilt a certain art deco feel which is entirely in keeping with the theme. This is the biggest quilt that I have spray basted and the first one with a white background. I must admit that I am a bit disappointed as the white background took on a patchy yellow colour after the basting. I don't think that I was heavy handed with the spray, but I guess I must've been. The yellow colour was really noticeable, and it bothered me too much to photograph it in that state. I made a diplomatic decision to wash the quilt before photography and see if it would look better. 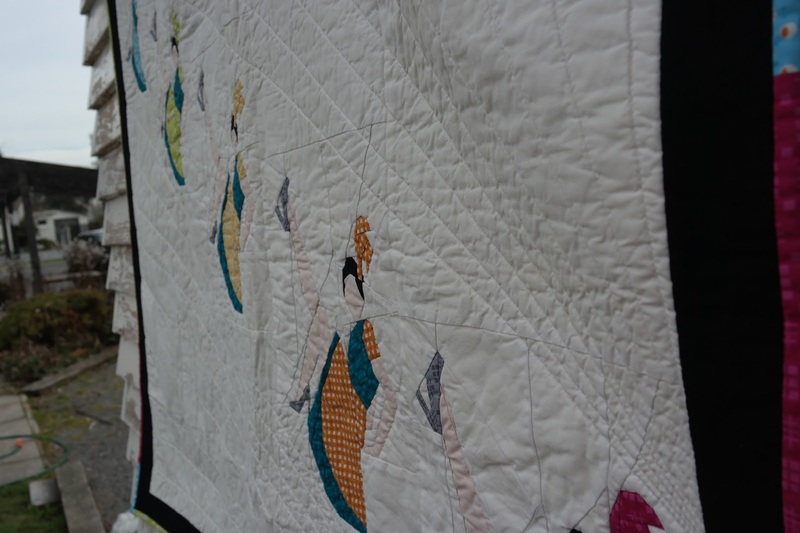 It does look a bit better, but there is still a yellowish tinge to some areas of the quilt. The yellow faded a bit in the wash, but disappointingly it is still there and I can't look at the quilt without a small degree of disappointment. It makes me annoyed to think that I spoilt the quilt in the final stages of its creation. Just to finish the quilt off, I gave it a scrappy binding. 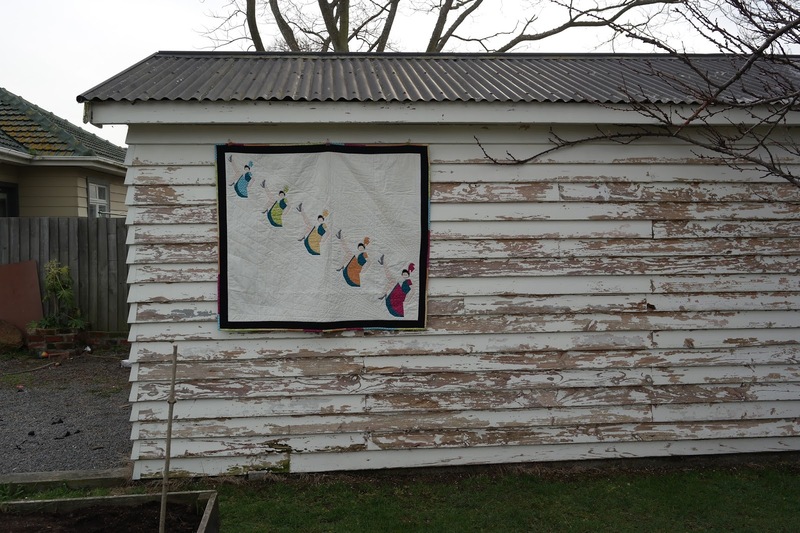 I think I'm a bit addicted to scrappy binding at the moment- it's so much fun and adds so much to a quilt. 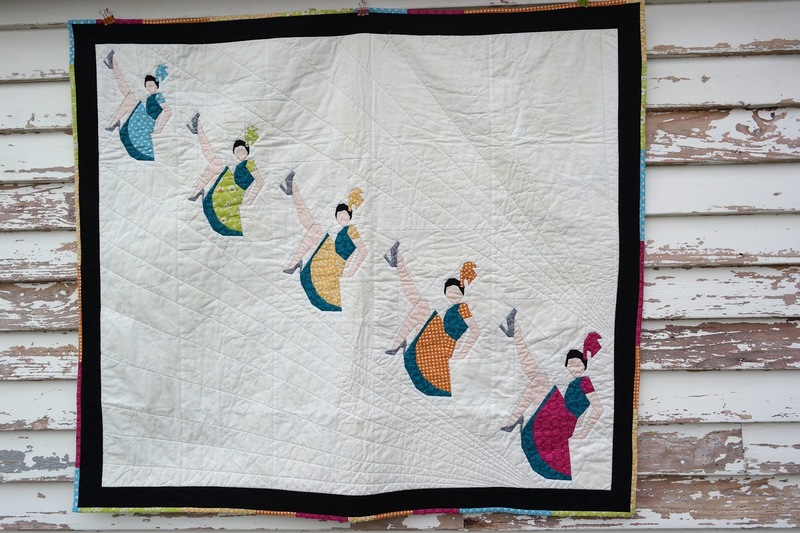 You can find the Chorus Line Pattern in my Etsy store and my Payhip store. With thanks to Deb Robertson for taking the awesome photos for me and RJR fabrics for letting me play with their awesome fabric. 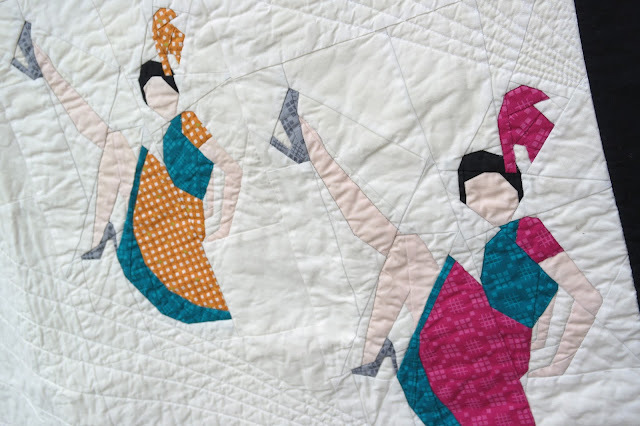 Love the way you have placed the dancers on the diagonal. Cool pattern. Love your can-can girls. Thought that shed wall looked familiar. I have had the same probably with spray glue, I try ti spray the batting now, not the quilt top when using it. I did smile when I saw this... it's just wonderful! Love the fabrics too! and the shed pic! The next time you wash a quilt with a white or pal background, soak it in nappy san with a few colour catchers in the bathtub overnight. The nappy san will help brighten your whites whilst the colour catchers will catch any dye run. Then you can throw it in the wash.
Good tip from Fiona about the Napison and color Catchers. Must note that, thanks. 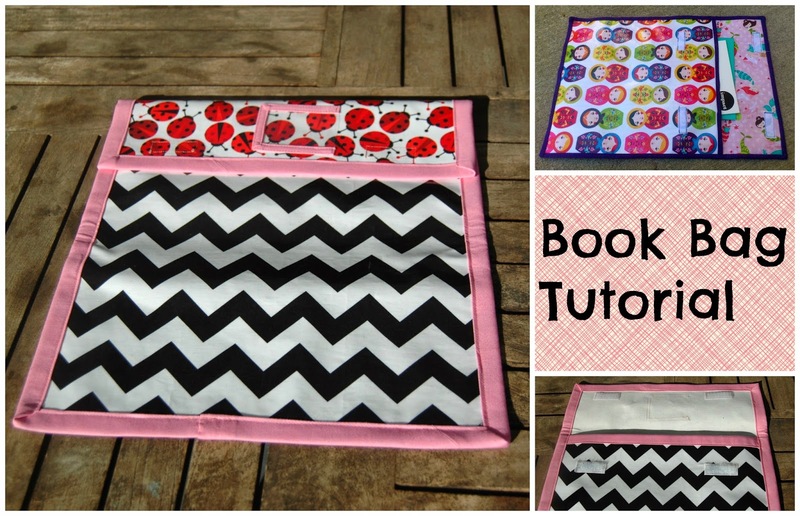 Juliet - I LOVE this quilt! Oh my, it's so fun and sophisticated. The different sizes and the perspective that gives is amazing. Nice job! What a fabulous quilt. It's fun and grown-up at the same time. It's a great block and I can see it working wodnerfully in so many different projects. I do hope the yellow colouring will disappear with future washes. I've not run into that problem myself and I only ever spray baste but I only ever spray the batting and never the fabric so perhaps that is why? Um favourite so far! Love the dancing ladies, I am so impressed by how your skills just grow and grow!